The national Under-23 soccer team, the Black Meteors, are scheduled to begin their preparations for the Athens Olympic Games with an international friendly against the national team of Portugal in Covilha next Friday, May 21. In connection with that, the Meteors will leave Accra for Portugal on Monday to conclude their fine-tuning for the duel. National team coach, Mariano Barreto, who announced this at a press conference at the Ghana Football Association (GFA) Secretariat yesterday also hinted that four foreign-based players have been invited for the match. They are Bayern Munich's Samuel Osei Kuffour, Asamoah Gyan and Sule Muntari, both of Udinese, and John Mensah of Modena. 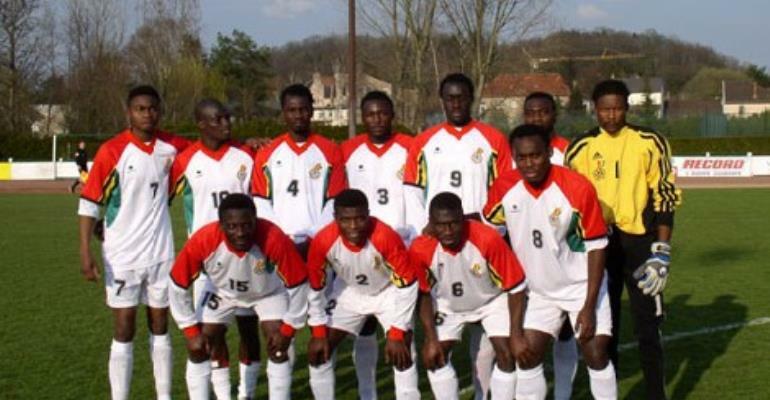 He indicated that on the team's return on May 22 the Black Stars, comprising both local and foreign-based players, will begin camping in France to gear up for the opening World Cup qualifier against Burkina Faso away on June 5. The Stars are expected to climax their build-up to the Burkina Faso encounter with an international away friendly against Guinea on June 1.According to the coach, the Stars will reassemble again on June 10 to warm up for a friendly against an unnamed country before travelling to Mozambique for another friendly on June 22 in preparation for the next World Cup qualifier against Uganda. Coach Barreto disclosed that the Meteors will then regroup on July 7 to step up their preparations with three or four friendlies in Europe before concluding their training programme with a tournament in Lisbon involving Paris St. Germain (PSG), FC Porto and Benfica in early August. The Meteors will finally leave for Athens on August 11 to participate in the Olympics Games, while the Stars go to camp again on October 4 to prepare for the World Cup qualifiers against Cape Verde and DR Congo. Though he pointed out that he is currently enjoying a good relationship with the nation's top four clubs, he explained that he would have no option than to rely on the 51 foreign-based players who are at his disposal now, in case any local player is not released by his club for national duty. He also confirmed that the GFA has accepted a proposal made by him to fly out injured Meteors goalkeeper, George Owu, for medical attention outside the country soon.